Friday beauty + bonus Big Cat video! – Trees & Flowers & Birds! Is there anything more adorable that Big Cats acting like baby kitties? I love to first go up as close as possible to see the dots. 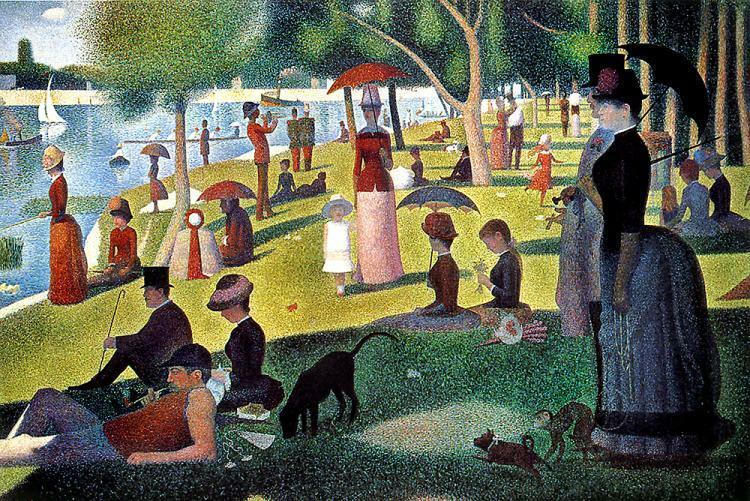 Seurat was using a technique called pointillism. Dots of pure color are used to create the larger images. Then I slowly step backwards and let my eyes adjust as the dots blend together. Mesmerizing! Loved the video! It was enlightening. The first autumn that I had my two cats, Izzy & Bella, I had put some small pumpkins and gourds on the dining room table as decoration. The cats were left alone for a few hours and when I came back, they had torn into the pumpkins. I had no idea cats like pumpkins and when I asked the vet about it, he didn’t seem to know either.